Chennai, 01 September 2017: Indian Institute of Technology Madras has launched a Green Drive in its premises with the objective of restoring green cover lost due to Cycle Vardah. The cyclone had hit the Tamil Nadu Coast in December 2016, resulting in the loss of nearly 650 trees inside IIT Madras campus. Most of the damaged trees were non-native species. Undertaken in two phases with a total budget of Rs. 25 lakh, as many as 1,200 saplings and trees are being planted and transplanted during this campaign. In order to ensure only native species indigenous to the soil are being planted, the species are being chosen with great care and from a Government of Tamil Nadu-approved list. 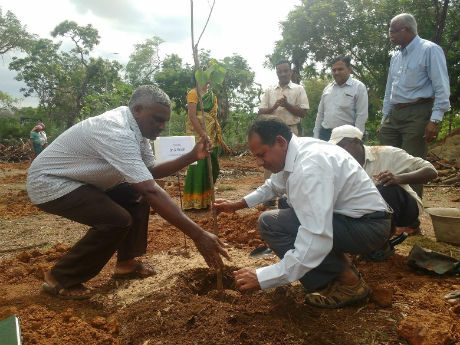 The trees and saplings are being sourced from Agricultural Engineering College and Research Institute, Tamil Nadu Agricultural University, Kumulur, Trichy district. Phase 1 of Tree Planting involves plantation of approximately 600 trees, each costing Rs 2,000 including the cost of the tree, tree guards, labour and maintenance. The names of the donors will be displayed suitably. Each tree would be at least 10 feet tall. The tree species including Mango, Gulmohar, Neem, Arasan, Maramalli and Wood Apple have been carefully chosen for shade and for food for the animals, of which there are plenty in IIT Madras campus. Donors can leave an everlasting mark on the institute by adopting a tree in the campus. A part of them will always stay with the campus.